The 12th annual year of Pathways to the Past walks and talks on May 26th & 27th was a very successful weekend. The weather was kind all weekend, and was well supported, with 40+ people for each of the three walks, and a good turn out for the talks. On the Saturday morning John and Jill Moss led a walk around Trencrom Hill entitled Just a hammer throw away. They visited the prehistoric structure and the three wells on the flanks of the hill, and told the story of the giants and their hammer throwing. 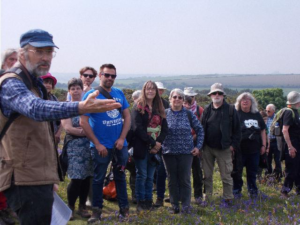 This was followed in the afternoon with a guided walk by David Giddings to The First and Last hills Chapel Carn Brea and Bartinney. A number of barrows were visited (including some difficult-to-find ones), and the china clay works on Bartinney explored. In the evening in St.Just Town Hall archaeologist Andy Jones gave an illustrated talk entitled Viewed in a new light: Hendraburnick Quoit and rock art in the South-West. This attracted a lot of interest, and gave a lot of detail about the excavations at Hendraburnick and theories of how it was used. Sunday morning saw another well-attended talk by archaeo-astronomer Carolyn Kennett entitled Cornwall’s celestial stones: reflections of the sky in an ancient landscape. Carolyn presented her original research on the solar and lunar alignments at Boscawen-ûn and other stone circles in West Penwith. After lunch it was the turn of Adrian Rodda whose walk was intriguingly titled Phantoms, Lovers, a Witch and a Saint. 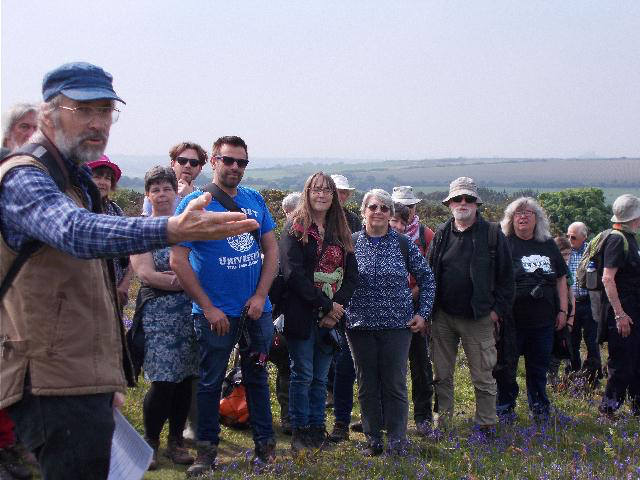 Meeting at St.Levan, Adrian visited the church where he read two of his story poems, and then led the large group on to the coastal path for a walk past St.Levan’s Cell to Porthgwarra, location for tales of lovers parted by a shipwreck and the Cornish witch Madgy Figgy. Finally, the weekend ended with a fascinating talk at the North Inn, Pendeen entitled A Miner’s Tale by Geevor miner Steve Carter. The weekend (all of which was free to CASPN members) was a feast of interest and enjoyment. For 2019 the dates will be Saturday 25th & Sunday 26th May and the programme will be available from early 2019 on this website.